The stocking stuffers that I used included gift cards, lottery scratch tickets, URLs to animal pictures that I knew would make him laugh, plans for a movie date, gum, Ninja patterned band aids, travel sized toiletries, and homemade baked goods, etc. (See my recipes for shortbread, sugar cookies, ginger snaps, coconut macaroons, meringues, almond nougat, and bacon jam from this holiday season.) 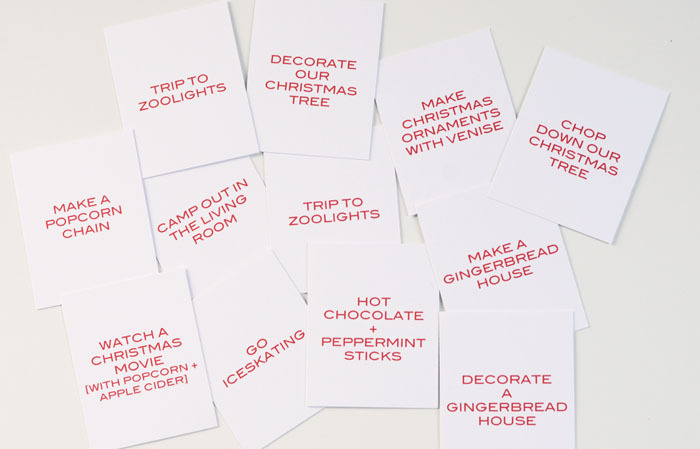 If you have kids, you could put activities in your advent calender instead of gifts or candy (see the calender here). So your family can spend quality time together doing fun stuff like making ornaments, decorating a gingerbread house, going tobogganing, or decorating the Christmas tree, etc. (see some great ideas here). I love her “camp out in the living room” activity. Next year, I think I’ll make this advent calender from Shim and Sons here. Choose your fabrics for the stocking and cuff. 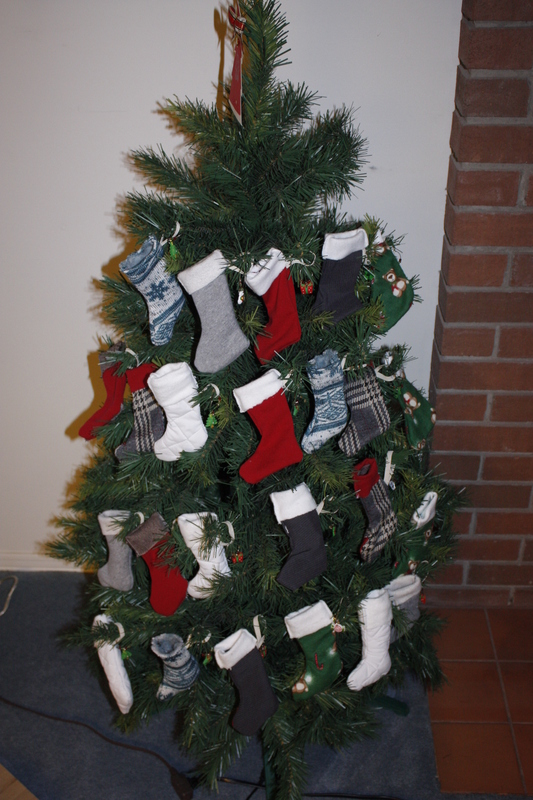 You could even use a different fabric for the heel and toe of your stocking (not covered in this post). I used quilted fabric, flannel, sweat pants, and dress/suit material, and I found that the heavy or thicker fabrics worked best. I used Martha Stewart’s stocking template here. For the hanger loop, you could use a 4 inch long piece of ribbon or a narrow piece of sewing elastic. The ribbon will have a nicer look but the elastic will be more durable if you’re planning on reusing these for several years. Using sewing chalk (or a pen), trace your stocking template onto your fabric twice. If your material has a one-sided pattern, then you must trace mirror images of your stocking template. You should arrange your cut outs in a way that conserves as much fabric as possible. Cut your stocking shapes out of the fabric and set aside. For the cuff, cut out two rectangles from the material measuring the same length as the opening of the stocking template and 2 inches tall. Set aside. From here on, the “front” will refer to the side of the fabric that will be admired when your stocking hangs on the tree. The “back” will refer to the side of the fabric that will be hidden on the inside of the stocking/cuff. Line up the top length of the cuff with the opening of the stocking so that the front of the cuff is touching the back of the stocking. Sew them together along the edge at the opening of the stocking. Repeat with the other cuff and stocking cut outs. Line up the stockings so that the fronts are touching. You can use pins to hold them together if you’d like. Orient the stocking so that the toe is pointing towards the right. Starting on the right side of the stocking, just below the line where the cuff meets the stocking, sew along the edge of the stocking but stop 1 inch below the line where the cuff meets the stocking on the left side of the stocking. Fold the ribbon (or elastic) in half and insert it between the two stocking pieces. 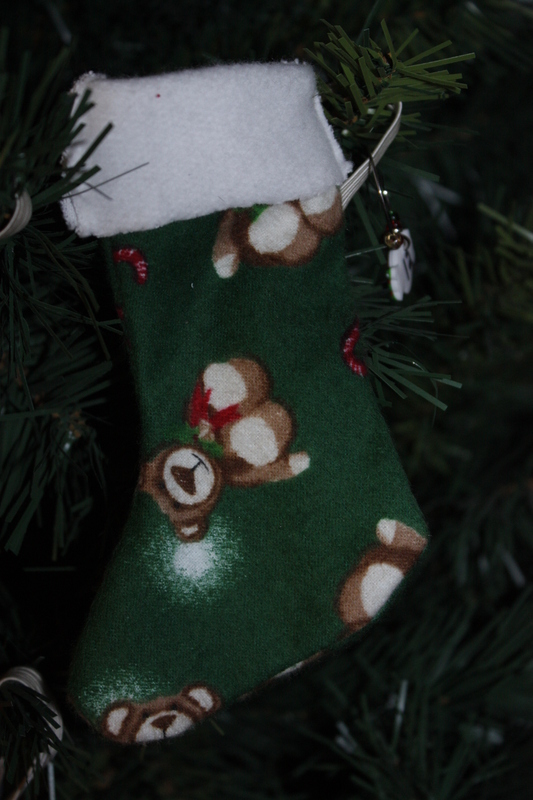 The ends should be just sticking out of the left side of the stocking, about 1 inch below the cuff. The loop should be pointing upwards and to the right, as if pointing in between the numbers 1 and 2 on the face of a clock. Finish sewing together the left side of the stocking by sewing through the ends of the ribbon/elastic and stopping just below the line where the cuff meets the stocking. Turn the cuff inside out. Check for any holes and make sure that the hanger loop is well attached. Then sew together the left and right sides of the cuff. 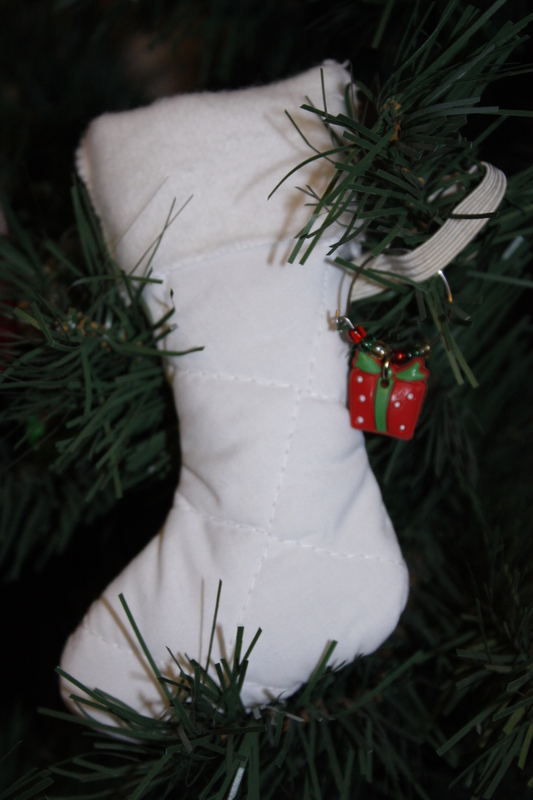 Roll the cuff down over the top of the stocking and add any embellishments that you’d like. If you’re making this for an advent tree, hang the number tag off of the hanger loop. Thank you so much Theresa! Happy Holidays to you too!